AirPlay Direct is a web-based artist marketing, promotion, education, and artist advocacy platform that delivers premium digital services and is the leading secure digital file transfer system for the music industry. We are a centralized communication system that connects artists, labels, radio stations, as well as equipment and services. We give direct and quantifiable contact with clients. All of our subscribers are qualified music industry participants. We have a national and international reach to over 7,400 radio stations around the world, 85 countries that is unmatched. We give direct access to the primary target market of artists, musicians, labels, and radio stations of all musical genres. Using proven technologies AirPlay Direct safely, reliably and cost effectively manages and delivers "broadcast-quality" digital content globally to radio stations and other professional destinations for music exposure. Our current services significantly reduce the time, effort, and cost associated with the manufacturing and delivery of music and promotional materials to radio programmers and music industry professionals. Currently AirPlay Direct provides digital delivery services to radio stations globally for over 32,000 artist and record company members. The company has over 7,400 registered radio station members. AirPlay Direct, is a leader in digital distribution of content to radio and music programmers around the globe, is pleased to announce their member benefit partnership with American Society of Composers, Authors and Publishers (ASCAP). Through this partnership, ASCAP members will be given the opportunity to expose their music worldwide with AirPlay Direct's services at a 50% discount. With an AirPlay Direct membership, ASCAP's members and affiliates can directly connect and securely send broadcast quality music and digital press kits to its worldwide community of top radio programmers and music supervisors. "We are thrilled to partner with ASCAP as we embark on another successful year at AirPlay Direct," says Robert Weingartz, Chairman and CEO of AirPlay Direct. "ASCAP's members will now be able to easily track global radio download activity and build ongoing relationships with music industry professionals around the world, which is vital in this industry." Used AirPlay Direct, but still have questions? 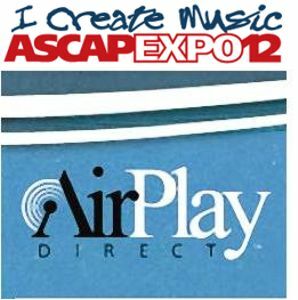 Come by and meet the team while you're at ASCAP Expo 12—or reach out to scottie@airplaydirect.com and book an appointment.